Nan Goldin has been fervently campaigning for more to be done about the opioid crisis. On Monday (November 26), the artist and drug policy activists gathered outside Governor Cuomo’s New York office to demand action on intervention. The demonstrators set up a large white tent that represented an overdose prevention centre, much like those that Governor Cuomo has failed to set up after promising action in the last election. 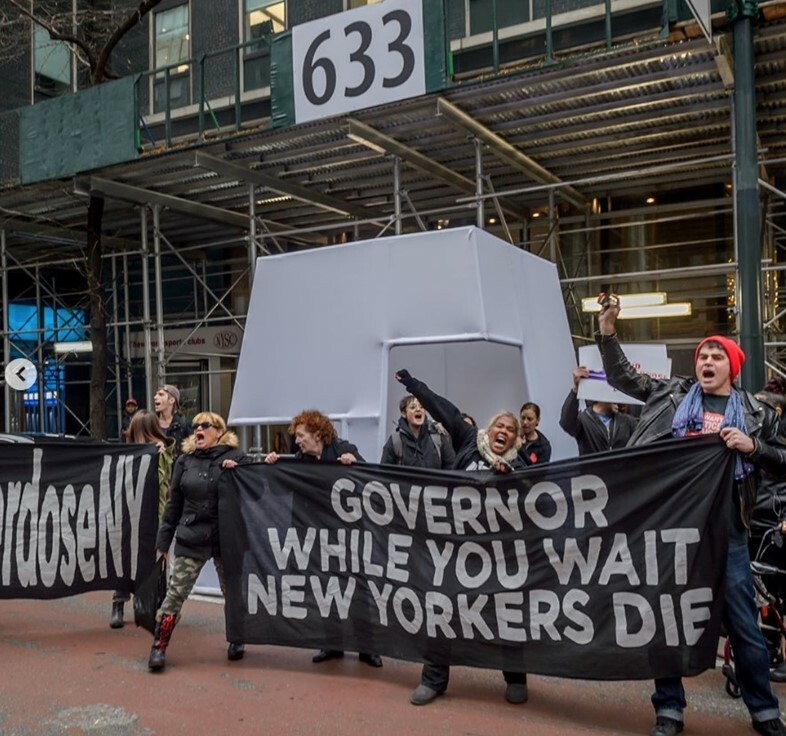 Activists group present included PAIN Sackler, Housingworks and VocalNY, carrying banners that read ‘END OVERDOSE NY’ and “GOVERNOR WHILE YOU WAIT NEW YORKERS DIE’. “Not one more! You wait – we die!” the crowd chanted. As Hyperallergic’s original article on the protest details, the New York Department of Health and Mental Hygiene published a huge report on a proposed overdose prevention plan for the city, but requires approval from the State Department of Health via Cuomo to enact anything. The election process halted at the beginning of November, and Cuomo has yet to say any more on work around prevention centres. Mayor Bill de Blasio endorsed his support for piloting four New York City overdose prevention centres, also known as supervised consumptions services, back in May. In 2016, Ithaca Mayor Myrick introduced the Ithaca Plan, which also advocated for overdose prevention centre pilot. In other states, such centres have been examples of positive drug policy. A 2008 study found that in Vancouver in 2003, where the first centre was created in North America, it helped prevent an estimated 35 HIV cases and three years each year then on. Other states including Maryland, Vermont, Massachusetts and Maine have introduced legislation to approve sites. Goldin’s PAIN group has been focusing their direct action at the Sackler family, who own Purdue Pharma, the manufacturers of epidemic-linked drug Oxycontin. In the last year, the group staged a ‘die-in’ protest at the Sackler wing of the Metropolitan Museum. Goldin has also opened up about her struggles with opioid addiction. VocalNY, a grassroots organising and harm reduction group, erected a huge poster in Times Square with staggering statistics about overdose deaths. More than 115 people die every day in the United States from opioid overdoses, with approximately 80 per cent of people who are on heroin first using prescription opioids. Between 2016 and 2017, overdoses increased by 30 per cent. Sign the petition demanding Governor Cuomo take action here.